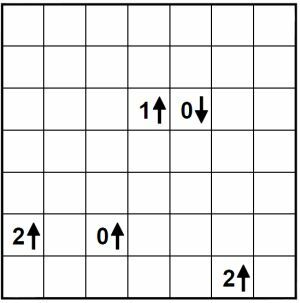 The picture to the right shows the start position of a yajilin puzzle. The puzzle is usually on a square grid, and in a range of different sizes. This sample puzzle is 7 x 7 in size. Although Yajilin is a rarely seen member of the loop making puzzle family, it is a very popular logic puzzle with many people who do try it, and infact tends to be easier and more accessible than many slitherlink puzzles. The aim is to work out whether each cell in the puzzle is part of the loop, or is to be shaded in. Any square that is not either a clue square or shaded must be part of a single continuous loop. Square that contain an arrow and a number indicate how many cells in that direction are to be shaded in. Shaded squares cannot touch each other horizontally or vertically: this means that the cells around shaded squares must all be part of the loop. A '0' means that there are no shaded cells in that direction, some solvers find it helpful to place a small 'L' in each cell in the appropriate row/column to remind them that each cell must be part of the loop. Not all shaded cells are pointed to by arrows: you need to work them out whilst solving the puzzle. For instance if you look at the sample puzzle to the right, the cell at the bottom right of the puzzle be shaded in grey. This is because it cannot be part of the loop as there is only one way in (or out) of the cell, and therefore it must be shaded in. This now means that the cell above it must be part of the loop, and since it only has one entry and one exit cell, the part of the loop through that cell can be marked in. Yajilin puzzles can be solved through logic and they have one unique solution. There are many enjoyable pieces of logic that the solver discovers as they start solving yajilin and get more experienced with the puzzles. These pieces of logic are fun to discover and then implement when solving future yajilin puzzles. If you wish to print or write out the sample puzzle on this page, the solution graphic can be found on our List of Puzzles page under the 'Yajilin' heading. Yajilin puzzles will make an enjoyable addition to any logic puzzles title or mixed puzzle magazine or book. If you are looking for something a little out of the ordinary to standard logic puzzles, then yajilin - and indeed other loop-forming puzzles - would make an ideal addition. If you are interested in purchasing Yajilin puzzles, then please do Contact Us with your requirements.